Recruitment doesn't end with a job offer. It begins from the moment your business defines its candidate audience, and continues long after an employee leaves your company. 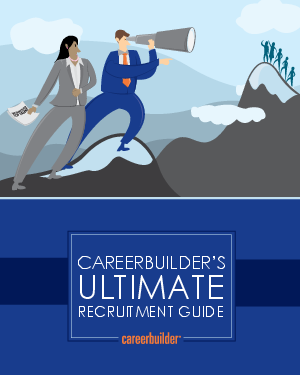 CareerBuilder's Ultimate Recruitment Guide e-Book is a definitive how-to-hire guide compiled by our team of business experts. It's stocked with the latest hiring tips and advice - and designed to equip you with the necessary information to make the smartest hiring decisions and hire the best people onto your team. You may know CareerBuilder as the nation's largest job board, yet we have evolved to be so much more. We are now the global leader in human capital solutions, helping companies of all sizes leverage technology and rich data to target, engage and attract current and future employees.